Artists sometimes become synonymous with the genres they work in. For many, The Beatles and The Rolling Stones practically define Rock and Roll music. Johnny Cash did the same thing for Country music. These are certainly not the only examples that exist, but certainly, they are notable ones in their respective genres. Hip-Hop, just like the genres mentioned above, has many artists whose stories and music are integral to the genre itself. N.W.A, Tupac Shakur and Notorious B.I.G are perhaps the names that would most readily come to the average fans’ head, but an artist like Eminem should be considered in this discussion as well. Eminem’s spastic flow and deeply personal subject matter dominated the late ’90s and early 2000s. His voice was something that had not really seen before, and his willingness to explore abusive relationships and develop both heroic and sinister characters was seen as something of a novelty for its time. This twisted, yet poignant voice went further than anybody could have anticipated and ultimately opened the door to hip-hop’s exciting and quirky future. Eminem proved that success in the rap game was not limited to anyone. The often controversial and abrasive tone of his music would seem to alienate many, but his charisma was still just too much for most to deny. He is an absolutely iconic figure in every sense of the word. While this fact can never be taken away from him, it’s really difficult to stomach where Eminem is at this point in his career. After a couple mediocre to poor projects in a row, one would have hoped that Eminem had hit his all-time low. The anger and character that he once harnessed completely shifted towards something tired and immature. The incredibly resilient rapper that once fought through hardships to make meaningful art has now resorted to merely rapping for shock recognition and accolades. On the heels of his both commercially and critically reviled early 2018 album Revival, Eminem has somehow found a way to fall even further down the ladder of relevance with his 2018 project Kamikaze. 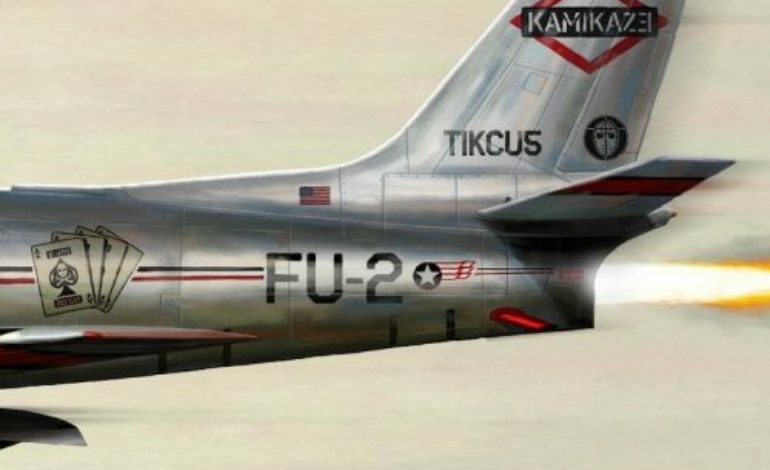 Built as a response to the backlash of Revival, Kamikaze reveals itself as a shallow and petty piece of work by an artist who no longer is in touch with what made him special in the first place. “The Ringer” embodies everything that is wrong with this project. Eminem fires at the entire industry, asserting his dominance over the rap game. While the flows are technically still ever-so impressive, Eminem’s incredibly bitter tone just ruins the entire song. Eminem spends most of this track by dissing rappers who are far below his echelon. In addition to this, he also implies that anyone who did not like his last album is an idiot. The arrogance coupled with the lack of creativity of the track’s concept perfectly displays everything that is going wrong for Eminem right now. He simply has attained so much success over his career that he no longer is okay with taking criticism. While Eminem has always fired back at his detractors, he has always done so in an honest way. On this album, he claims to have given the audience a “porterhouse” with Revival. This was certainly not the case, as that album was plastered with lazy gimmick flows, uninspiring hooks and incredibly poorly mixed and mastered production. Kamikaze is not different in the slightest. With the exception of “Lucky You,” the production on this project is incredibly lifeless. “Normal,” while sincere in its topic matter, features some of the most painfully cliché rap lyrics of the entire year. “Not Alike” parodies Migos’ “Bad and Boujee,” but completely fails to highlight what exactly is so much better or different about Eminem compared to these other trendy rappers. Lastly, “Venom” is an incredibly annoying closer. Its prickly flow is just unpleasant on the ears and ultimately ends this album with a whimper. While Eminem certainly is a larger-than-life figure for the Hip-Hop genre, he needs to realize what made him this in the first place. The characters he painted once showed some real depth. These aliases may have been frightening or downright violent at times, but they always appeared human and never came off as boring. Ironically, Eminem attempts to be as unfiltered as possible on this album, yet creates his most boring project yet. Where once the lack of filter was once seen as someone confidently asserting himself over the rest of the rap industry, it now seems like more of a defensive tactic. It seems like one last ditch effort for Eminem to jump-start start his career back to relevancy. Unfortunately, those days appear to be done, but at least at the end of the day, we can say we have had an incredible run.